Ouzel Falls drops 40' through a narrow chute and flows under a long bridge across Ouzel Creek. Ouzel Creek continues a short distance to a dramatic convergence with North St Vrain Creek, the Wild Basin Area's primary drainage. The trail rises gently beside North St Vrain Creek to spurs for Lower and Upper Copeland Falls (.35 and .45 miles). Mild travel continues to the backcountry campsite access trail (1.35 miles : 8,860'), crosses the creek and climbs .45 miles to Calypso Cascades (1.8 miles : 9,108'). Calypso Cascades - powered by Cony Creek - fan out across a steep granite cliff. It flows under two long bridges above the confluence with North St Vrain Creek. The trail winds past Calypso Cascades up a north-facing valley wall, passing for a short time through an area stricken by the 1978 Ouzel Fire (2.0 miles : 9,100'). Grasses and wildflowers brighten these once charred hillsides, while young aspen and pine emerge in replenished soils. Downed trees open the forest to sweeping views of Mt Meeker, Longs Peak and the northern Wild Basin Area. 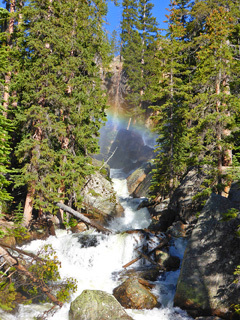 A moderate climb through lodgepole, spruce, and fir leads to Ouzel Falls (2.7 miles : 9,366') and a lengthy bridge across its turbulent base. Social trails leads from either side of the bridge to closer views of the falls, but climbing the falls is strongly discouraged, as the terrain is uneven and deceptively slick. Exercise caution when scrambling, and maintain a safe distance from moving water. Those with time may consider continuing to Ouzel Lake or Bluebird Lake, 2.25 miles and 3.65 miles up from the falls, respectively. Ouzel Falls and Ouzel Lake are named for the Ouzel - or Dipper - a small bird that dives into cold mountain streams and 'flies' underwater to catch insects on the bottom. Fishing regulations are location-specific and subject to change. Check with a Ranger for current restrictions. There are numerous back country campsites en route to Ouzel Falls and Lake. Check with the backcountry office well in advance, as they're popular sites that occasionally close due to bear activity. The Wild Basin Area is heavily traveled; get an early start to avoid crowds and secure parking. "Weekend parking is getting ridiculous in Wild Basin. You have to arrive early (before 10) or face having to walk 1-2 miles up the road. When I returned yesterday the lot was closed off by rangers and people were walking up the road like it was Main Street." "The trail is fairly passable after a good amount of holiday use, but Wild Basin road is closed at the winter parking gate near the entrance station - you'll have to walk or ski the (long) road to reach the trailhead." "I now have my most favorite hike in all of Colorado! I went on a beautiful Saturday in the height of tourist season and thoroughly enjoyed my day hiking up to Ouzel Falls. It was about 75-80 degrees and sunny, absolutely perfect. Even though we passed many people along the trail it never seemed too crowded. We had to wait about 5 minutes to get a parking space since we arrived around 11:00. The trail is well maintained and a joy to walk. The views are spectacular. The pristine mountain air and clear water of the creek were refreshing and delightful. Many great photo ops. The rangers were friendly and helpful. I highly recommend this wonderful jewel of the Rocky Mountains." "We hiked to Calypso Cascades and Ouzel Falls. It was 25 degrees, no wind, very foggy, and there was a dusting of snow on everything. It was more beautiful, in my opinion, than in the summer. The fog and the silence were enchanting. The first of the fall leaves are just mixing with the last of the summer flowers. We saw around 15 people all day, so not crowded. The bridge is still gone at Ouzel Falls but there is a temporary trail to the falls. There was still plenty of water since we've had a rainy summer so the falls were great! This was my favorite hike this year!" "Hiked up to Calypso Cascades today. You have to park in the Winter Parking Area which is about a mile to the ranger station and the trailhead. The road is mostly covered with snow but it is very soft. The road to the Winter Parking Area is very rutted in places but no problem getting there. The trail from the ranger station to the Cascades is completely covered with snow 1-3' deep. The bridges are all covered with snow but passable. Snowshoes are recommended, I did the hike with boots and chains and I wish I had my snowshoes. It's a 3 mile hike to the Cascades. The bridge over Ouzel Falls was washed away so I didn't go that way. Ranger told me it will be over a month before road to trailhead will be open."